Most people hear about Lowlander from a friend who's an aficionado of the amber brew (beer, if it's not your tipple). But those beer-lovers are often known to come back with friends in tow, who might not usually drink beer, but are partial to a good serving of moules and frittes. 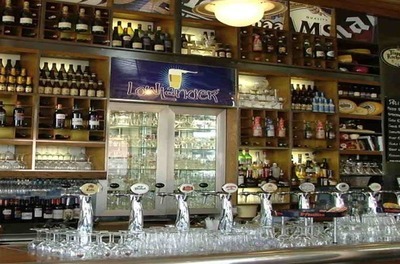 For this is a bar and brasserie in the Belgium sense of the words, meaning the tables are long and communal, the atmosphere is a little loud but friendly, the beer comes in a rainbow of colours and flavours and the frittes are served with mayonnaise. But it's all good! The staff need to be psuedo-beer-professors. There are so many ever changing options on the list – including the fruit beers, which are worth trying even if you don't usually drink beer. This means that you're talked though a choice of 15 tap beers and upwards of 50 bottled beers, and often end up sampling a far greater range of beers than you might have intended. There's also more than just moules on the menu, there's also moules in biere. And burgers, steak, pot roasts, and fish pie. They even serve 'Double Dutch Fries': imported from Holland and double fried. All up this makes for an evening of very warm hospitality. You'll be wanting to bring your friends back too.